Beer Fridge Blamed For Cellphone Network Blackout : The Two-Way Engineers for Australian cellphone provider Telstra say they recently found what was disrupting the mobile data network in several neighborhoods: a man's beer fridge. Technicians say an electric spark in the motor evidently created enough radio frequency noise to interfere with the network. 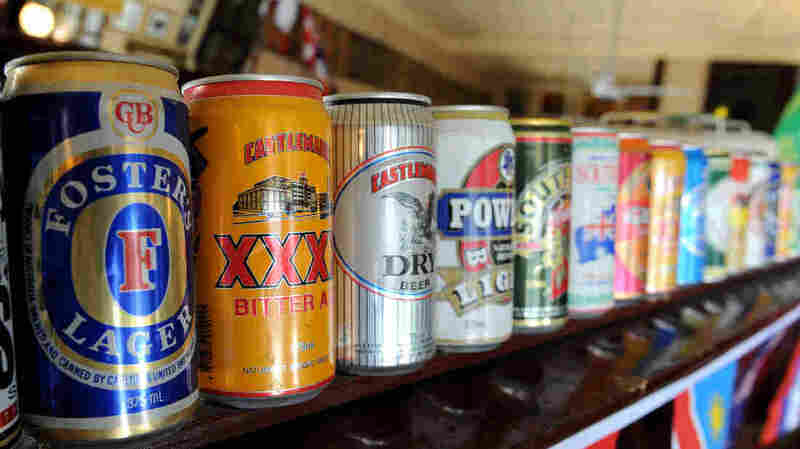 A row of beer cans in Australia, where a man's beer fridge has been blamed for playing havoc with the cellphone network in several neighborhoods. Faced with reports of a "black spot" that interfered with the mobile network in several neighborhoods, technicians at Australian cellphone provider Telstra say they recently found the source of the problem: a man's beer fridge in his garage. The refrigerator was tracked by "software robots" and workers wielding special antennas. "I'm amazed something like that could knock out part of the network," Craig Reynolds of Wangaratta, northeast of Melbourne, tells the Herald Sun. "You're certainly going to stop and wonder. I'm going to run and see if my fridge is all right next time there's a problem with the network." The beer fridge's motor was blamed for causing the disturbance, with Telstra engineers saying that an electric spark evidently created enough radio frequency noise "to create blackouts on the 850mHz spectrum that carries our mobile voice calls and Internet data," according to the Herald Sun. Telstra's Greg Halley tells the newspaper that technicians used directional "Mr. Yagi" antennas (aka the Yagi-Uda antenna, named for its inventors) to track the precise location of the disruption. In the past, they've found ATM machines and illegal signal boosters to be culprits. As you might expect, the engineers deal with hundreds of such cases each year. "The sources vary — it can be domestic equipment, it can be [TV] masthead amplifiers, it can be electric or plastic welding stuff in industrial estates, it can be illegal repeaters," Telstra manager Richard Henderson told iTnews. "There's no particular focus now on beer fridges," he added. The incident has sparked discussion on Slashdot, where comments ranged from discussion of "how dodgy does a motor have to be" to disrupt the network, to a more pressing question: What did Craig Reynolds do with his beer?